Whether you choose to wear your hair up or down, discover these boho-chic styles. Learn how to style two braided hairstyles for your wedding day! Step 1: Part your hair in two sections to create pigtail braids. 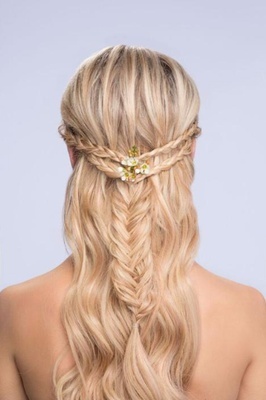 Create two fishtail braids on each side of your head. Take a small section from the back of the left piece and wrap it over the top of the right piece. Then take a small section from the back of the right piece and wrap it over top of the left piece and continue until you run out of hair and band the end. Repeat for the other section of your hair. Step 2: Grab each braid and tie in a knot in the back of your head and pull tight. Step 3: Secure the two ends with pins. Be sure to hide your pins so they are not seen. Step 4: Add flowers for décor. Step 1: Curl your hair with a curling iron and brush out the curls to create loose bohemian waves. 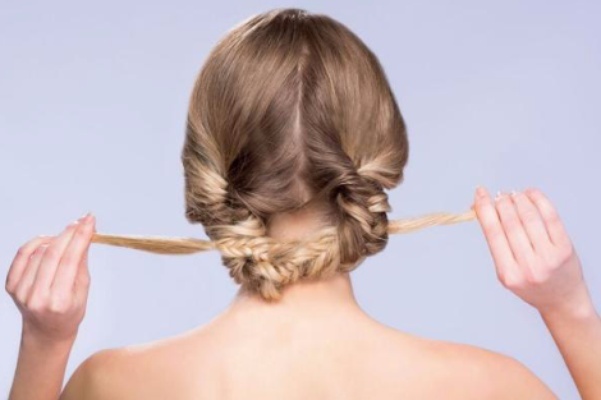 Take two small pieces of hair from the front of your head and braid them back half way down. Do this again on the other side of your head so now you have four half braided pieces of hair, two on each side of your head. Step 2: Start a fishtail braid down the center of your head by using the ends of the 4 braids you just created. Take a small section from the back of the left piece and wrap it over the top of the right piece. Then take a small section from the back of the right piece and wrap it over top of the left piece. Step 3: Repeat Step 2 until you run out of hair and band it at the end to secure the braid. Add some flowers for décor. Deciding on a hairstyle is a big factor for brides in wedding planning. Not only do you need a perfect hairstyle for yourself, but you have your bridesmaids to think about as well. Not to mention engagement parties, bridal showers, rehearsal dinners, and your bachelorette party! If you’re hoping to go for a bohemian look for any of your wedding events, or you’re just looking to show off your braiding skills, these two DIY bridal looks could be a great fit for your celebration. Whether wearing your hair up or down, braids help to personalize a look and are pair excellently with an alfresco boho-chic wedding. Adding flowers and greenery used in the bridal or bridesmaid bouquets ties everything together in a naturally elegant manner. 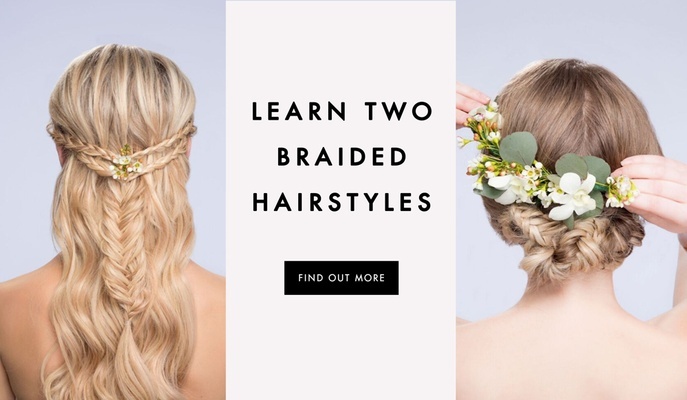 Check out the step-by-step guide in the above slideshow to learn not one, but two simple and beautiful DIY braided hairstyles. All you need are some fishtail braids, bobby pins, and clear elastic bands. But remember – as with anything DIY, it is important to practice, practice, practice. 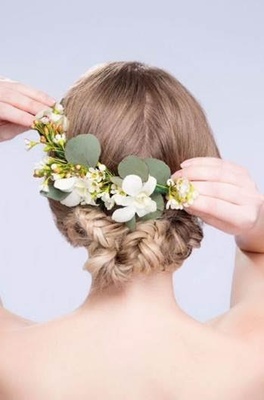 The steps may be straight forward, but even professional hairstylists have trials for bridal hair! For more wedding hair inspiration for your upcoming wedding events, visit our photo galleries and our Bridal Hair Inspiration board on Pinterest.